Getting rid of shoe odor and smelly feet can be a challenge, especially if you have a tight schedule that requires you to wear closed shoes all day. However, there are plenty of natural and chemical ways that you can use to get rid of shoe odor. To make the process of combating shoe odor simple and cheap, I am going to discuss the best 9 ways to get rid of shoe odor. Most of these ways are natural and easy to implement. Okay, when we wear shoes, our feet will naturally sweat, resulting in a damp environment and when combined with dead skin cells, the odor-causing bacteria finds a better place to attack. So, we can conclude and say; sweat or rather a moist environment is the main cause of shoe odor. The best way to treat stinky feet is practicing proper feet hygiene. When I say proper feet hygiene, I mean washing the feet regularly and correctly. As I had said earlier, sweat and dead skin cells are the main cause of shoe odor.So, cleaning your feet regularly and correctly ensures no sweat and dead skin cells are present on the feet, and thus no bad odor will be present. 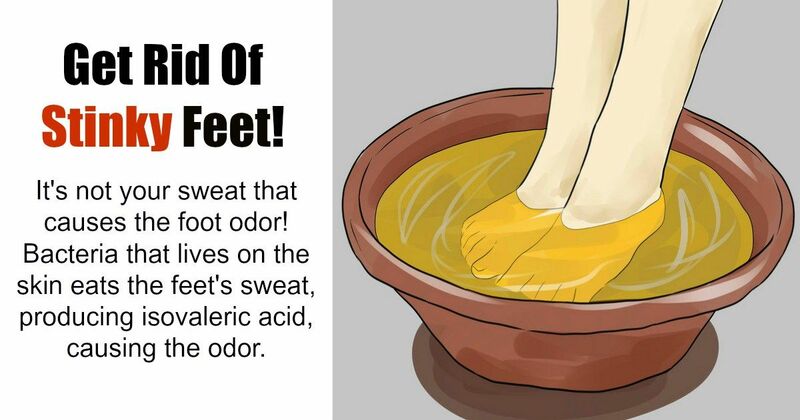 If you have been wondering how to get rid of smelly feet naturally and effectiveness, wearing the proper shoes could be your answer. To get rid of shoe odor for good, do not wear shoes that are too tight or too loose; wear shoes that are just fitting. Also, wear shoes that are well-ventilated most of the time. If you have to wear closed shoes all day, surprise your feet with open shoes once you are done with the day’s activities. This helps air to circulate on the feet reducing the chances of bacteria attack. and socks. When you don’t wash your shoes, the sweat that sneaked through the socks remain on the inner side of the shoes offering a breeding ground for bacteria.Once you put the clean feet and socks in that shoe and begin to sweat, the odor-causing bacteria continuous to spread, causing shoe odor. Alternating your footwear also helps get rid of shoe odor. When you alternate your shoes, you give them humble time to breathe, and any sweat that could have embedded on the shoes dries completely. Once the sweat is dry, no bacteria can survive in the shoes and hence no shoe odor. For this reason, it is advisable to clean your shoes before alternating. Another way of preventing and getting rid of shoe odor is by using proven home remedies such as baking soda, essential oils, and lemon. Even if the home remedies have distinct formulae and method of application, they all strive towards one goal; defeating the odor-causing bacteria. If you have been trying to get rid of shoe odor without attaining the desired results, it is the high chance you now try the foot antiperspirant. An antiperspirant has been designed to fight bacteria that affect the sweaty areas We are all familiar with the antiperspirant applied beneath our arms to fight body odor, right? The same case applies with the foot antiperspirant, combined with proper feet hygiene; it will fight and eliminate shoe odor. Wearing a pair of socks every time you put on your shoes helps get rid of shoe odor. Since much of the sweat has been absorbed, there will be little to no moist environment, and as a result, the odor-causing bacteria will not have a reason to attack. Just like the pair of socks, dryer sheets work by absorbing sweat from the feet. This means, placing a pair of dryer sheets in your shoes before wearing will help get rid of shoe odor. for causing the awful odor. However, leaving your feet not well dried or wearing wet shoes greatly contributes to shoe odor. Like I had mentioned earlier, a moist environment offers a conducive place for the odor-causing bacteria to breed. So, to stay away from the bacteria, always make sure your feet and shoes are completely dry before wearing.